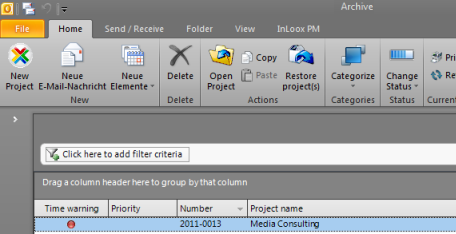 In Outlook 2003/2007, click InLoox PM Folder in the InLoox PM Toolbar and then Time Tracking in the InLoox PM project list. The newly created project is displayed in the InLoox PM project list. Click the InLoox PM tab and then Projects in the View group. Delete project Remove a selected project by clicking the Delete button. Open, copy and paste a project These buttons can be found in the Actions group .The Copy and Paste features help you to create projects quickly. You can change them as you want. Categorize a project Choose a project from the list and click Categorize in the Categories group. Assign a category to the project without opening it. Change status You can also change a status or a degree of completion of the selected project in the list. Click Change Status and choose from the list the respective status, e.g. started or completed..
For more information see How to add further information in the status / date area. Print an archive view In the Current View group, click Print to start the quick print feature of the archive view. Open a project Double-click on one item in the list or right-click on the item to open the context menu and choose Open from the list. Search the projects The search bar permits to find quickly any information also within a project. You can also use filter feature. The context menu provides you with almost all basic features that are also on the InLoox PM Ribbon, such as Restore project(s)..., Open Project, Delete Project, Refresh, Copy and Paste. It has also such features as Expand and Collapse All Groups, Show Filter. Right-click in the list to open the context menu. How to edit the InLoox PM 7 archive view • Copyright 1999-2019 © InLoox, Inc. All rights reserved.